Galway had the more direct route of the two teams, playing only four matches to Waterford's five. Whereas Galway won all their matches in Leinster, bringing them to an automatic semi-final, Waterford lost their opening match against eventual Munster champions Cork, and had to go through the qualifiers. Waterford, however, got through these games with relative ease, and gained revenge on Cork in the semi-final to reach the final. As both teams have had very different routes, and since neither have met one another in the championship since 2011, it makes it difficult to determine their relative strengths. Both teams are known for their defence, their ability to control possession, and their tendency towards long-range shooting. Waterford lost a game, Galway didn't, but it could also be argued that Galway had easier matches within their province this year. Both teams scored and conceded very similar numbers: Galway scored an average of 29.5, Waterford an average of 29.6, while Galway conceded an average of 18.75 to Waterford's 21.4. From the beginning, both teams were viewed as being in contention: Neither were favourites for the final, or for the championship, but both had odds which were well above average. Again, the initial odds were very similar between Galway and Waterford, with Galway having the slight edge following their league win. We can see in this chart how Galway and Waterford, and other teams, influenced their odds with each game. Waterford took a large dip after their surprise loss to Cork; had they won, they would been in the quarter finals, now they had to win two extra games to reach the same stage. Both teams had a slight boost in their odds as Tipperary were knocked out of Munster and Kilkenny out of Leinster, as the computer had ranked them as the initial favourites. However, Galway found their odds lowering when they found themselves against Tipperary in the semi-final anyway. All in all, it appears that the computer has slowly found itself favouring Galway over Waterford, despite the similar starts. Why did this happen? The chart above shows how much above expectation each team performed over the course of the championship. Put simply, the rating system believes that Galway won 1.2 games more than expected (an average of 0.3 per match), and Waterford won 1.13 games more than expected (an average of 0.23 per match). In other words, both teams performed above expectation, given who they were playing, by a similar amount. Galway, however, did slightly better, given the opposition, and so they now find themselves rated higher. Of course, as with everything with these teams, there seems to be very little between them, and it's still up in the air who will win on Sunday. Since we can't find much between Galway and Waterford, let's look instead at Galway and Waterford in 2016 versus Galway and Waterford in 2017, and discover how they improved enough to reach an All-Ireland final, after coming unbelievably close last year. The chart below shows how the rating system has rated both teams over the last two years. It gives a clear, visual indication of both team's up and downs in 2016 and 2017, throughout the league and the championship. In this chart, the highs and lows of both teams can be seen. Though Waterford have displayed consistency throughout, they have hit a new peak this year by reaching the final, despite performing worse in this year's league. Galway, meanwhile, have made great strides over 2017. Though they reached a semi-final last year, they reached the same spot much more convincingly this year by winning Leinster. Additionally, they were relegated in last year's league, while they won the league in 2017. So, both teams have made an improvement over last year; though Galway's improvement is more evident, Waterford started from a better spot, typically appearing in the top three teams in the country. Looking through the All-Ireland matches, there maybe isn't a huge amount of difference in the actual results: Galway will have played the same number of total games, Waterford will have played one more this year. Both teams lost twice last year, and depending on the result of the final, this year Galway will have either one or zero losses, Waterford will have had one or two. Again, we're struggling to find the real differences between the teams. However, there is one area where I believe that the difference becomes clear, and it's all games really come down to in the end: scoring. 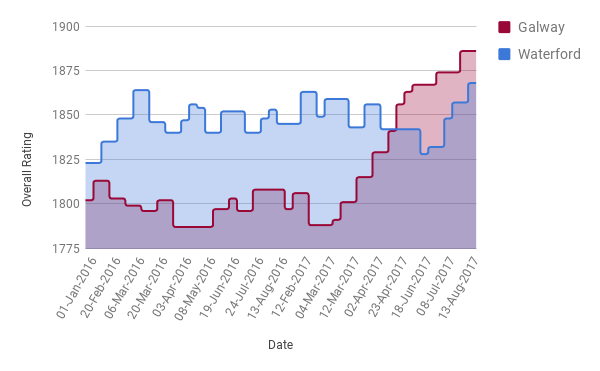 The above chart displays the average amount both teams scored and conceded in the All-Irelands in 2016 and 2017. It also breaks down the score by how much came from goals versus points. To clarify, the number next to the goals is the score from goals, not the number of goals. A value of 6.6 here is equivalent to 2.2 goals per match. As mentioned earlier, both teams had similar scores this year: Both scored about 29-30 points per game (though goals made up a greater share of the score for Waterford). Both teams conceded about the same too, though Galway were slightly tighter defensively, conceding about 19 points per game versus Waterford's 21. Similar numbers, though Waterford did better with goals, scoring more and conceding fewer. Where the numbers really differ is in between the 2016 and 2017 values for both teams. 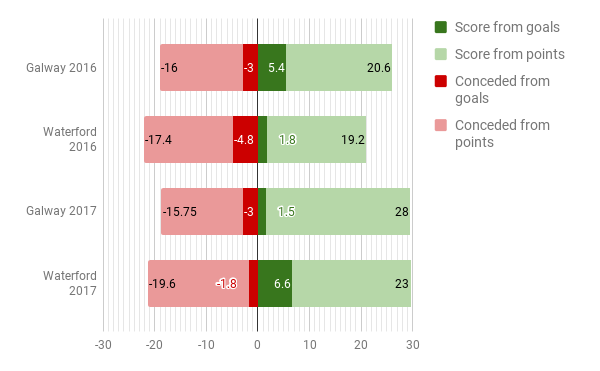 Galway concede almost exactly the same as they did last year, but by taking their points and fewer goals this year, they've upped their scoring by almost 4 points per game. Not a bad improvement at all. Waterford's defence has gotten very slightly looser, giving up an extra point per game, but they now score a massive 8.6 points more than last year, an incredible difference. Though the difference is most obvious in how many more goals they've been getting, they've increased their point output too. So, what can we say about this year's final? Who should win it? Well, though the computer has given Galway the edge, this look back at how they've performed has only raised more questions. Both teams have had large winning margins. Both have performed a similar amount over expectation. Both have built on their solid defensive bases and added more scoring this year. Both teams have been elevated from being in-the-running to genuine contenders. Both teams are long overdue for an All-Ireland win, and have suffered heartbreak in the recent past. One team will end the drought. One will have to prolong it for at least another year. It is a hard match to call, but emotions will run high either way. Should be a great final.